Water play is wonder play. 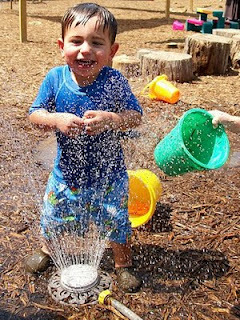 Sprinklers, misters, spray bottles, and water slides have refreshed us and delighted our senses during this very hot summer. But water play is so much more than just splashing. 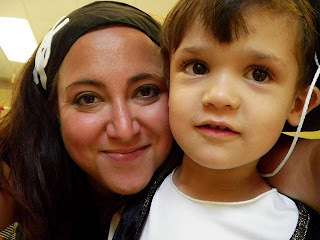 At The Little School we are big proponents of learning through play. 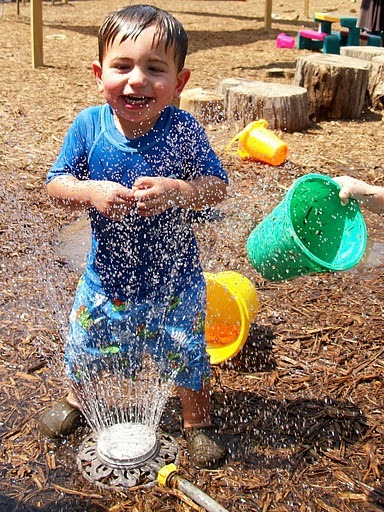 Not only does water play provide great fun and relief from the heat, water play also provides a multitude of learning experiences for young children. It is important to offer a variety of different materials to facilitate these experiences. Here are some examples of what we may add in the container category: Bowls, buckets, watering cans, recycled containers of different sizes and shapes, small plastic cups, spray bottles, and more. Some other materials to have on hand to help children explore and experiment include: Measuring cups and spoons, corks, food coloring, soapy bubbles, aquarium nets, various scoops, eyedroppers, funnels, plastic squeeze bottles, plastic tubing, sponges, strainers, whisks, basters, hand mixers, and more. For pretend play provide plastic dishes, toy boats, plastic baby dolls, cars/trucks, plastic fruits and vegetables, etc with sponges for washing. Paintbrushes and paint rollers and plastic sea creatures (like Ms. Rose shares with us :) are also great materials for imaginative water play. Don’t forget your rubber duckies and beach balls! 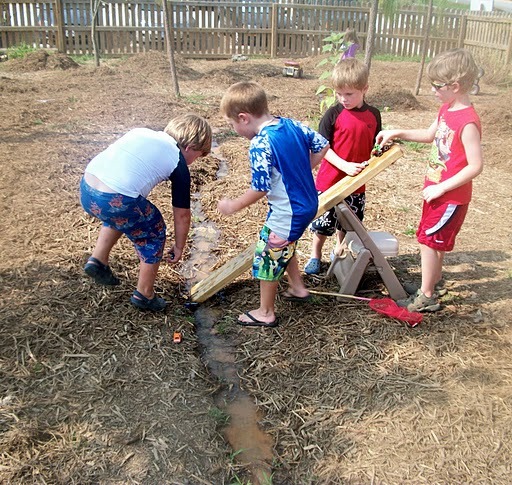 Water play is sensory play. It is good for children’s physical development as well as cognitive and social-emotional development. 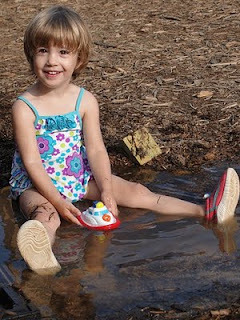 As children enjoy the water they are developing their fine and gross motor skills. As children play in the water with their friends they are learning to play cooperatively and are developing social skills. They are also exploring and learning cognitive skills, such as how some objects sink and others float. They are learning new vocabulary that goes along with water play, such as funnel, surface, sink/float (and perhaps even buoyancy), strain, empty/full, wet, dry, slippery, cool, warm, and more. 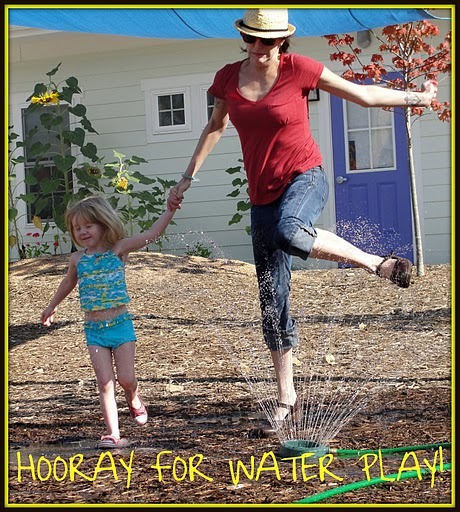 Water play really is wonder play when you look at all of the benefits. At TLS all classrooms participate in water play! 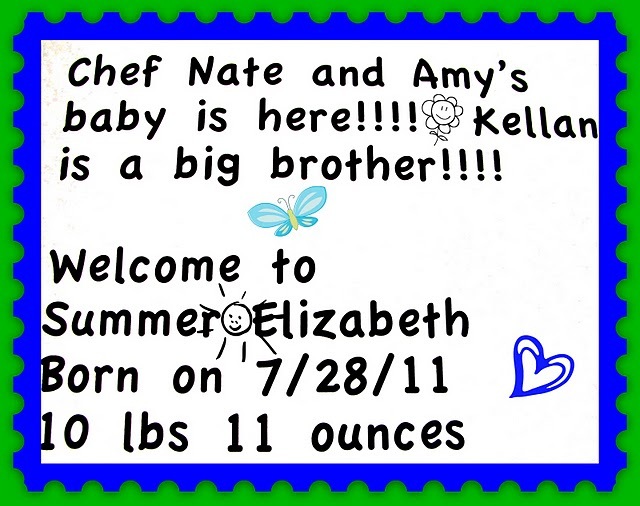 This is evident in the many slide-show images, which depict a wide range of joyful exploration across different ages. Often teachers will include additional activities, such as painting with watercolor ice-cubes, drawing with wet chalk, blowing bubbles or other sensory endeavors like shaving cream. Sometimes our attention goes to surprise guests, like toads or katydids. Other times may involve learning about cause and effect, such as altering the water flow by kinking a hose or using a shovel to create a dam. 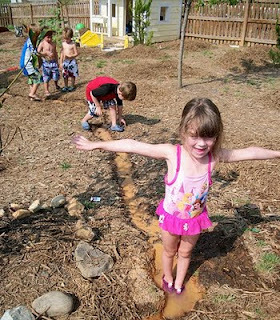 The pre-schoolers experience rich activities around the “lazy river” that they make, from jumping off a board (notice friends stabilizing board in slide show) to a car ramp. On another day, friends tasted blue corn from the garden with Diana, while others played with tin-foil boats. Looking at books together is always a favorite activity available during water play as well. Thank you to all of our teachers and children for the wonderful photo opportunities. Below you will find two examples of water play activities that you and your child(ren) can enjoy as well. Try this cooling-off version of Duck, Duck, Goose. Have players (kids and grown-ups!) sit in a circle. The first person to be "it" walks around the circle with a cup, pitcher, or watering can, dribbling a few drops on each person's head—until he chooses a player to be drenched with all the water from his container. Then the wet player chases “it” around the circle while “it” tries to claim the player’s empty spot in the circle. (You could also play a modified version with just a spray bottle, saying Duck as you walk around and then only squirting chosen friend, while saying “Squirt”). Freeze water in milk cartons and plastic containers to create large blocks of ice—you can even add a drop of food coloring to each if you like. Take them outside and have kids build with them (a little salt helps the blocks stick together). Take a picture of the creations before they melt! 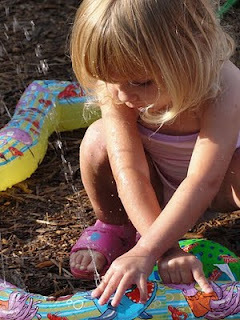 Stay cool and have fun with your water bugs :) Learn through water play! 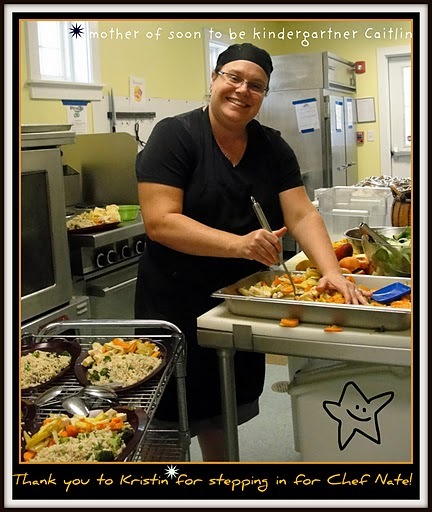 STAFF SPOTLIGHT ***shines*** on Leigh! She teaches with Lulu and Nicole and brings her enthusiasm to a classroom of “amazing 3 year olds” and brightens TLS with her musicality. In addition to playing guitar, she also plays clarinet, piano, and the folk harp. Currently her class is learning a rap song about litter patrol, which is something they have been focusing on this month. They use music -- often provided by Leigh herself -- to teach many concepts in their class. Throughout the day transitions are accompanied and enriched by song. They also experience new genres of music through dance! This week her class enjoyed a Jackson Five dance party. Captain America. I read comic books as a child. My husband and I go to the movies almost every week. The book "East of Eden" by John Steinbeck had a big impact on me. I checked it out from the library in high school and immediately fell in love with the portrayal of the great good and great harm people can do to each other. I would want the ability to fly or instantly transport myself to wherever I wanted to be. I love to travel! I remember Christmases as being a magically happy time. My father would let me help peel potatoes in the kitchen (which I loved), my mom and I would make and decorate cookies, and we would spend all day at home, listening to The Carpenter Christmas album, watching movies, and enjoying our time together. A special ed teacher. It still may happen. I play a few instruments already, but I love the sound of the cello and would love to learn to play. I would be my 2000 Honda Civic. It is a color I call "raisin". It was my first car and I love how dependable it is. I have two. The Sneetches and The Lorax. I love the environmental message in The Lorax and the message about conformity in The Sneetches. I have a beautiful Renaissance era dress my mother bought for me. We chose all the most gorgeous fabrics (maroon velvet, pink satin, gold trim) and the pattern, and a friend's mom sewed it. My high school chorus hosted a Renaissance feast every year and it was my costume. I have never felt prettier. "Theories of personality" was my most interesting college course. There were no tests or formal assignments, but we kept a journal about ourselves and evaluated our dreams, choices and personal history in it as we leaned about Freud's thoughts on dreams, Jungian archetypes, etc. I feel that I learned many things about myself, and I still have that journal. I don't know if anyone will remember this cartoon, but I really wanted to be "Jem" from the cartoon "Jem and the Holograms.". She was a singer with pink hair and magical earrings. I love that we get to explore what is of interest to the kids! They are such little scientists and I learn so much from being with them! 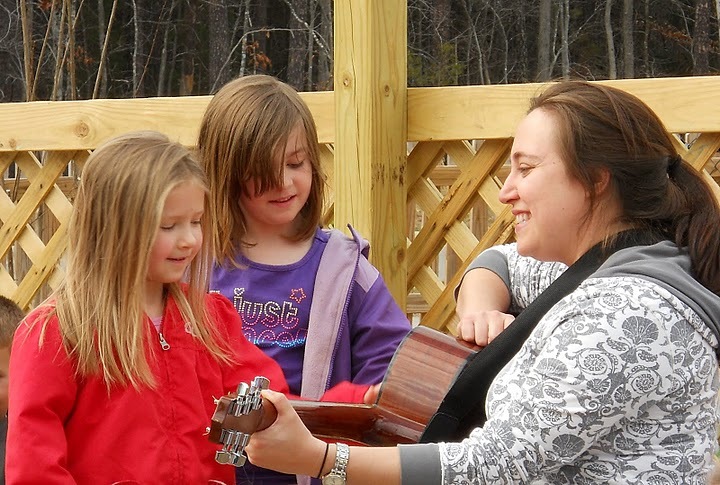 Thank you to Leigh for her musical contributions and dedication to TLS! P.S. 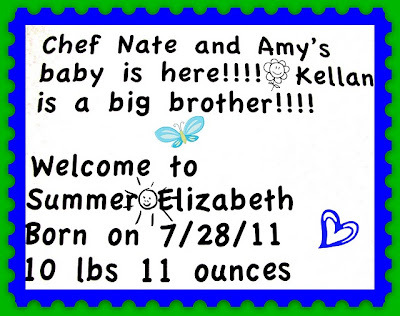 Comments or questions to the blog are always welcome! What are your favorite water play ideas?